Hummingbird Food. What do Hummingbirds Eat? Understanding the hummingbird food diet will help to create a backyard habitat for them and we will be able to contribute in ways that assure their survival. Have you ever wondered what do hummingbirds eat? Hummingbirds survive on protein from bugs and are fueled by the nectar! Many assume that nectar is the key ingredient to a hummingbird's survival because we see them at our feeders constantly seemingly to have a never quenched thirst for the sweet stuff! Who does not enjoy watching hummingbirds? We never cease to be amazed by this remarkable bird. When it hovers at our feeders or darts from flower to flower, we peak at one of nature's true wonders. How much food does a hummingbird eat in a day? While an average hummingbird weighs only 0.1 to 0.3 ounces, it consumes 1/2 it's weight in food per day. No dieting for the hummingbird! They do need to eat practically all day long. Incredibly, while in flight these tiny birds beat their wings 2000 to 3000 times per minute. That's right! I did say per minute. What fun it is to watch such tremendous energy from such a tiny bird. That's why they need so many calories to keep their engines humming. They will drink the nectar from hundreds of flowers in a day. 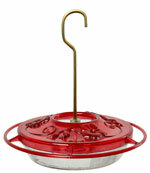 Hummingbirds eat the nectar from the feeders that we supply. Here is some of the latest and interesting hummingbird news! Researchers previously thought tube-like channels in their tongues sucked up fluid by capillary action. But the new analysis shows that their tongues actually trap nectar by curling around it. Margaret A. Rubega of the University of Connecticut, was published in the "Proceedings of the National Academy of Sciences". Check out this amazing video showing a hummingbird's tongue in action! You can make your own hummingbird food recipe! We would like to share our hummingbird nectar recipe, a ratio of sugar and water. 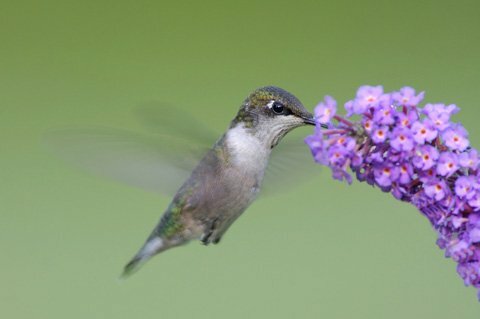 We have been using this hummingbird nectar recipe to attract and feed our hummingbirds for many years. Some people buy commercially packaged nectar. If you choose to use a commercial nectar as hummingbird food make sure that it is natural and contains no artificial dyes. We have found a commercial hummingbird nectar product with a natural red color made from hibiscus flower extract. 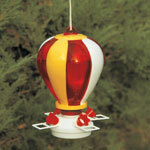 Hang several hummingbird feeders and fill them regularly. favoring red, orange, pink and purple flowers with a good nectar reserve. 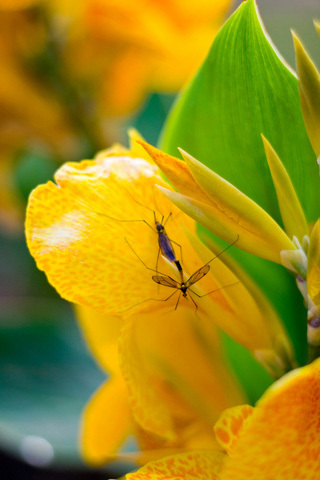 You might plant a hummingbird flower garden which can include a hummingbird vine and/or a butterfly bush. Shape matters. Trumpet shaped flowers are most often preferred but are not exclusive. Hummingbirds eat nectar strictly for energy. Subscribe to "The Hummer" newsletter (to the left) and receive a FREE Printable Version of our "Hummingbird Nectar Recipe". 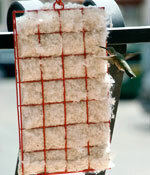 Hummingbird food also needs to consist of protein, vitamins, and minerals from insects. They are fast bug eating machines in our backyard. Hummingbirds live on the edge of survival. When a hummingbird does not have enough food.......to conserve energy, it can go into a sleep-like state known as "Torpor". "Torpor" is their natural adaptation to prevent starvation. Feeding hummingbirds with nectar alone is a common myth. Many don't realize that they need to eat insects to build muscle mass, and for protein, vitamins and minerals. Nectar is an essential hummingbird food for energy only. I'm not particularly fond of insects, especially the blood sucking kind. Are You? Yet, I've learned to consider the consequences to the food chain of birds. 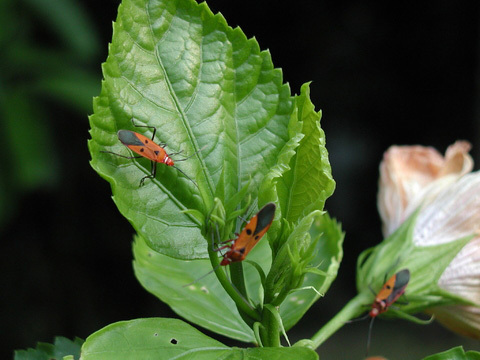 I no longer spray them away with insecticides.This can diminish the food supply and sicken the birds. A show to see (you might like to get your binoculars) is a hummingbird perching on a bare, open twig in wait for a swarm of flying insects. When the prey is spotted, the bird "hawks". What you get is the best aerial acrobatics entertainment as it performs a series of twists, and twirls capturing in mid-air. What a sight and the admission is free!...........Learn more about Birdwatching Binoculars. Also, they eat tree sap from holes drilled by sap suckers. I was surprised to learn that these delicate birds "poached" food resources from other foragers, especially spiders. That's life in the wild! In my view, hummingbirds work hard enough to obtain food. Remember, all of that hovering......just to get a decent meal. Besides, some poaching can be risky business. When these small birds poach from spiders, they sometimes get caught in the web and die. Roughly a third of a hummingbirds diet is bugs. Hummingbird food is mosquitoes (the blood sucking kind), spiders, gnats, fruit flies, and sometimes even small bees. During a rain storm, hummingbirds eat small insects rather than nectar. If you ever wondered, they do eat much more before migration starts. Hummingbirds need to gain 30% - 40% of their body weight before migration. They store their undigested food in a small pouch at the base of the throat called a "crop". Even when they are perching, food is being moved from the crop to the stomach for digestion. Do they ever get a moments rest? I appreciate our winged friends even more by understanding their importance to our eco-system. They eat the insects in our gardens, so spraying harmful insecticides would eliminate our opportunity of feeding hummingbirds with insects along with our feeders. So now you know the answer to.......What do Hummingbirds Eat! Of course they drink the nectar in the flowers and feeders but they also need water. 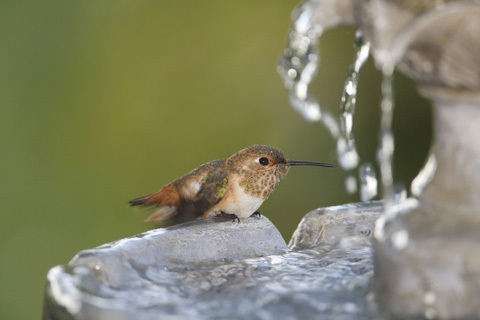 Hummingbirds are able to find many water sources right in your backyard. We've all heard the expression "drink-in the morning dew." They will sip droplets of dew formed on foliage in the morning or after a rain. They will come to a bird bath or a puddle but the water level must be shallow or even better, supply a birdbath with a mister in it. 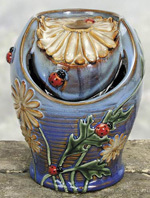 If you already have a birdbath, an easy solution is to add a Solar Mister to it (No Electricity Needed). Hummingbird water might be supplied with the the mist of a mister attached to a garden hose which they love to fly through. Dry conditions can be a challenge, but you can help with a bird bath or a mister. A common misconception...........feeding hummingbirds is not just providing nectar!